The more I see lipstick around—on album covers, in fashion shoots, and out on the street—the more I seem to like it. I believe that’s called a mere-exposure bias (“a psychological phenomenon whereby a person develops a preference for a stimulus based solely on his or her repeated exposure to [and subsequent familiarity with] it.” –Robert T. Gonzalez), but that’s fine with me. So, of course, I decided I had to make my own! I’ve been thinking about trying DIY lipstick for a while, and I’ve learned from my various forays into tinted lip balms. I thought about trying a variety of different colourants, but in the end, I tried my Australian Red Reef Clay first. The colour is just so deep and wonderful that I just had to. I began with a fairly straight-up lip balm recipe. I included shea butter and avocado oil for their uber-moisturizing qualities. I also added magnesium strearate—just the tiniest bit to help with slip, as I’ve found adding large amounts of powdered pigments to lip balm can make it “skid” rather than slip across the lips. And for the colouring—the deep, red clay. I mixed it all together with a few drops of peppermint essential oil until I had a thick, oily red mess, and poured it into lip balm tubes. After it set up, I gave it a test drive. BAM. WOW. Now that is lipstick! Dark, red, moisturizing, and pepperminty. Awesome! I love this shade with buffing of my airbrushing powder, filled in eyebrows, some eye bright, a bit of eyeshadow, and a good coat of mascara for a glamorous, 1940’s/50’s inspired look. Oooh, look, I found my inner Zooey Deschanel! Melt the beeswax, shea butter, cocoa butter, avocado oil, and magnesium stearate together in a small saucepan over low heat. 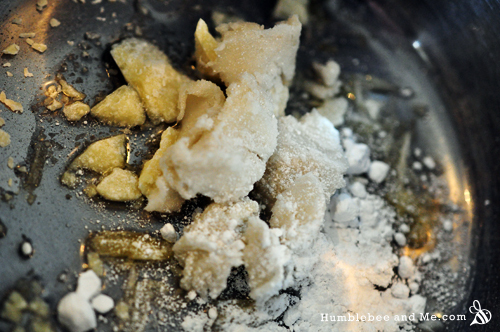 Thoroughly stir in the clay and essential oil, and then pour into 4 lip balm tubes. Enjoy! I find this lipstick is best applied with a brush as the colour is so dark, so a tin would also be a great place to store it. Wow, now that is a colour red that I would just love to wear. Thanks, Almarie! I just love how all the colour comes from a totally natural clay 🙂 It also changes appearance in different lights, taking on more chocolatey tones in lower lights. Where does one get Australian Red Reef Clay???? I get mine from New Directions Aromatics. GREAT idea! Nicely done :-). I don’t wear lipstick because I both a) eat if off my lips 5-10 minutes after I apply it, so it seems wasted, and B) it usually dries my lips out. I love how mousturizing this must be, and the endless possibilities for coloring totally boggle me. Wheeee! Thanks, Christine—those are exactly the problems I was trying to solve! 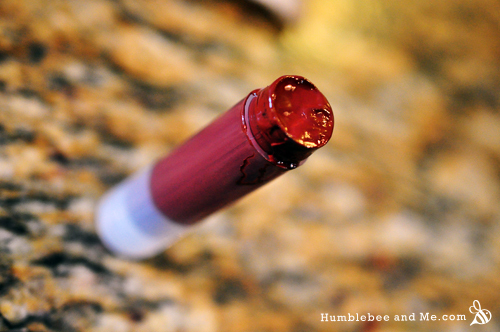 This homemade stuff is super inexpensive (no $50 tubes of lipstick here!) and it is just packed with moisture for your lips 😉 Stay tuned for tons more colouring options! 😀 I can’t tell you how thrilled I was with this when I first put it on—I wasn’t expecting such a perfect, dark red, but it was just what I wanted! Have fun with it, it’s awesome! The color is perfect! And the ingredients are so simple even I could make this. I have the same problem of eating my lipstick off my face because I snack so often, but I wouldn’t be concerned about eating this haha. So pretty I love this colour! Where can you get the australian red reef clay!? I got this awesome clay from New Directions Aromatics! You sound just like me—excited about all the possibilities the second you come across a new idea 🙂 Stay tuned for more entries on tons of different colour variations, I’ve already made at least 6 different kinds of lipstick, lol 😛 For pigments you can use clays and oxides, both of which are super fun to play with! I get pretty much everything from New Directions Aromatics. Thanks 🙂 Stay tuned for lots more awesome lipstick recipes! I love that red , it looks great on you . My daughter and I just made lip stick and it turned out great also. I hope you do not mind if I share what we dit it was fun and cheap . We took no toxic crayons added now we used one hole crayon but we would brake up different coloured to make the amount of one crayon, ( the coloured you can make are endless which we love) then add 1/4 honey 1/4 to 1teaspoon 1 teaspoon coconut oil and just a little dab of olive oil. You just melt in microwave a few and stir and put in a lip stick tub or a tin . It works great and it stays on for quite some time. Thank you for letting me share . Well, I just can’t wait to try the lipstick and Sapphire blue. I just ordered from NDA for the first time, but it will be nice to have a second supplier. Thanks. Yes! I just discovered Saffire Blue and I love having access to all their awesome ingredients (mostly herbs) that NDA doesn’t have. WOO! More goodies! 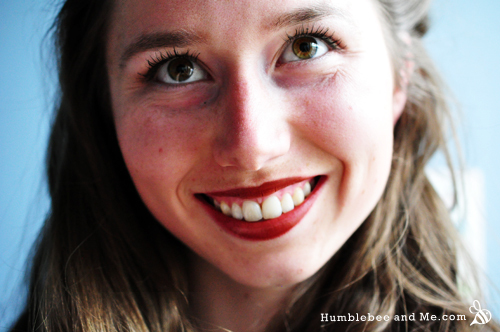 I stumbled across a picture of your lipstick on Pinterest, which caught my attention and I ended up on your blog! And I am so glad that I did. I have recently (in the last 6 months) made a switch to as natural of make-up as I can, (along with many other positive changes) and the idea of making my own lipstick, knowing exactly what is in it and having none of the chemicals, preservatives, additives, etc. in something that will get absorbed into my skin is so exciting! I can’t wait to give this a try, thanks for your awesome inspiration! It looks so pretty! Yay for Pinterest 🙂 Congrats on your switch to all natural make-up, I’ve got heaps of recipes on here that should help you. I’m always working on making natural, DIY versions of the things I’ve found in stores. Feel free to request things, I love a new challenge 🙂 Mascara is the only thing that continues to elude me, but I’ll get it one day! That’s beautiful! I’m going to have to try it! Thank you! Thank you so much for DIY Rose Red lipstick. My daughter will confirm that there is nothing I love more than a lovely gel eyeliner (again, once of your recipes that I intend to try) and a nice red lip. It is highly wearable both for work, play and date nights. Plus there aren’t any nasty chemicals! Maureen—Thanks for reading! I hope to someday develop a good gel/water activated eyeliner recipe… I have thrown out a lot of colourful goop so far, haha. I do love the look, though—a great cat eye and red lips is a totally classic, flexible look! What is it’s staying power? I love red lipstick, but not on my straw, my fork, or my boyfriend. Also, what would you recommend as a substitute for cocoa butter? My boyfriend is deathly allergic to chocolate and even cocoa butter will make him blister. I’ve read that kokum butter can be a good substitute for cocoa butter as it has a similar texture, but I’ve never tried it before. I find this lipstick stays on about as well as any lipstick does. Basically, it’s great at your desk and when you’re out and about, but as soon as you start eating or drinking, farewell, lip colour. That said, stay tuned for my awesome new lip STAIN recipe! It’ll be out in a few weeks and I LOVE it! sounds like a really neat idea, i am gonna try it some time. I will NOT get mad if you would like to send me one of these. 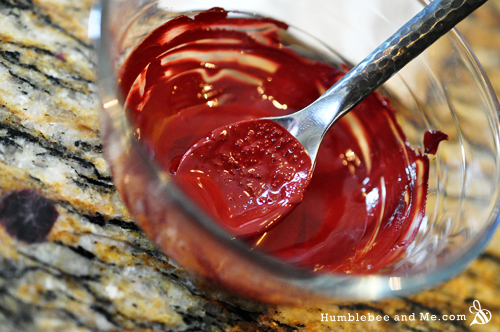 This color is amazing and I just don’t have the time/ingredients to make it. But I want iittt!!!! It’s such a hard thing to find that right shade of red that you apply, and boom you know this is it. The color looks amazing. I must try this. Wow ! This is the first time I’ve seen anyone make their own lipstick ! Really beautiful ! Thanks! I had a lot of fun playing around with it—I’ve got lots of recipes for different colours coming up! I sell Mary Kay and I still love this idea because in the past many prior lipstick brands with hidden titanium dioxide have inflamed my lips and left a literal bad taste in my mouth! I love everything I sell now and really hope to find a great staining red to fall in love with in my brand. However, DIY always made me happy and I prefer the quality control of making my own for myself or others if needed! I don’t want to get in trouble but the fun of mixing my own started years ago with samples collected from the mall & sniffed to check for titanium dioxide contamination. I’m interested to hear that you’ve had bad experiences with titanium dioxide in lipsticks—I have used it before to no ill effect. Are you allergic? When you make this does it feel gritty on your lips. I only ask becuase when I tried to make lipstick with beet root powder it felt gritty and yucky. Nope, it’s perfectly smooth 🙂 I, too, tried making beetroot powder lipstick and it was terrible, lol. That’s because beetroot is water soluble, not oil soluble. Clay is neither, so it blends nicely with the oil rather than clumping up and being gritty and awful. Avocado oil is a thick, super moisturizing liquid oil, so I would choose something like macadamia nut, jojoba, oat, or wheatgerm oil as a substitute. this clay is my next NDA purchase bc i *must* make this! i feel like ive got everything else to make this, and am super psyched to do it. i also fully appreciate the lip balm roots of your recipe as i am completely addicted to lip balm and making lip balm. Ha, the never ending NDA wishlist problem! Mine is always growing, and every time I need to make an order (“need”, haha) because I’ve run out of some staples I have to delete half the stuff out of my cart so I’m not dropping obscene amounts of money on new essential oils just because I’m curious, lol. That colour looks really good on you! I’m fair and blonde….I wonder if it’d be too dark? Would half the amount of clay lighten it a bit? Aww, thanks! If you want to lighten it I’d recommend blending it with something pale/white, like kaolin clay. I would recommend layering this over a SPF rated lip balm—I don’t recommend DIY sun protection. i think for me its a tad dark, and unfortunately my clay is more brown than red…but for my first attempt at a lip color, it went well! it feels nice on, not gritty or heavy like i was worried it would…id never worked with clay as a colorant nor magnesium stearate. but its just like a lipstick, strong pigment leave and everything! thanks marie for the recipe! Yay! I love hearing that somebody’s actually made one of my recipes 🙂 I found that the clay really plays with the light, and can appear a dark, ruddy brown rather than rose red in certain lights. I’ve found I can really only pull off the colour if I’m wearing other make-up that pulls it all together, otherwise the colour is too strong for me (it would probably be a fantastic everyday colour for people with darker skin, though). For other colourants I’d recommend red oxide, yellow oxide, maybe a mica (for sparkle), and carmine! WOOT! Thanks for reading and DIYing! Ohh did you get your clay from the same brand that she used? I got my clay today from a different brand and it’s more of a rusty orange color..
Lovely color! I was just wondering if you can recommend something other than beeswax? I am vegan and don’t use beeswax. Your two vegan wax options are carnauba and candelilla. I haven’t had a chance to experiment with either of them in lip balms or lip sticks, but I do know it is not a simple 1:1 substitution as they are both harder than beeswax and have different melting points. I’m sure you’ll get it with some experimentation, though 🙂 Maybe start with lip balm, so you don’t have to fuss with colour as well. I called around town and apparently no one sells it, so I will have to get some online and will keep this in mind. For what it’s worth I got mine from Saffire Blue. New Directions Aromatics carries it, but the smallest amount they sell is ~1lb, and I didn’t want to pay for that much without experimenting with it first. Awesome!!! I’m so thrilled to hear it 🙂 I’m glad the chocolatey-ness works for your complexion—I find I need to make sure I do my eye make-up and powder my face with a bit of bronzer to be able to pull it off. Would you share a photo of your final product? I’d love to see it! Brilliant idea! Can’t wait to try. Can you please suggest what other clay / options we can use for pink, purple, brown tones? I have tried beetroot powder but doesn’t give much color to the lips! Hey—if you poke around I’ve got about half a dozen different lipstick recipes up here, so you should be able to find what you’re looking for 🙂 And yeah, beetroot powder is pretty rubbish for colouring, sadly 🙁 I found that surprising, considering how many shirts I ruined with beets as a child. No problem! You should know that all the clays do come out a lot more brownish than you might be used to. I often cut them with a white clay to brighten/lighten them up. Then again, I’m pretty pasty, and colours that heavy/dark don’t work as well for me as they do for other people. Why don’t you want to use oxides in your lip colour? I’ve had great success with lipsticks coloured with oxides. Hey, thanks again. Are oxides not harmful to us if ingested ? Also, are they different to mica? I ordered some beige and pastel pink clay and tried a pinch of pastel pink one in my lipstick recipe and it does look good. A but on the brown side but it does actually look quite dark in itself. Might add a pinch of beige the next time to tone it down a little. Wow, what a gorgeous shade; it’s very becoming on you! 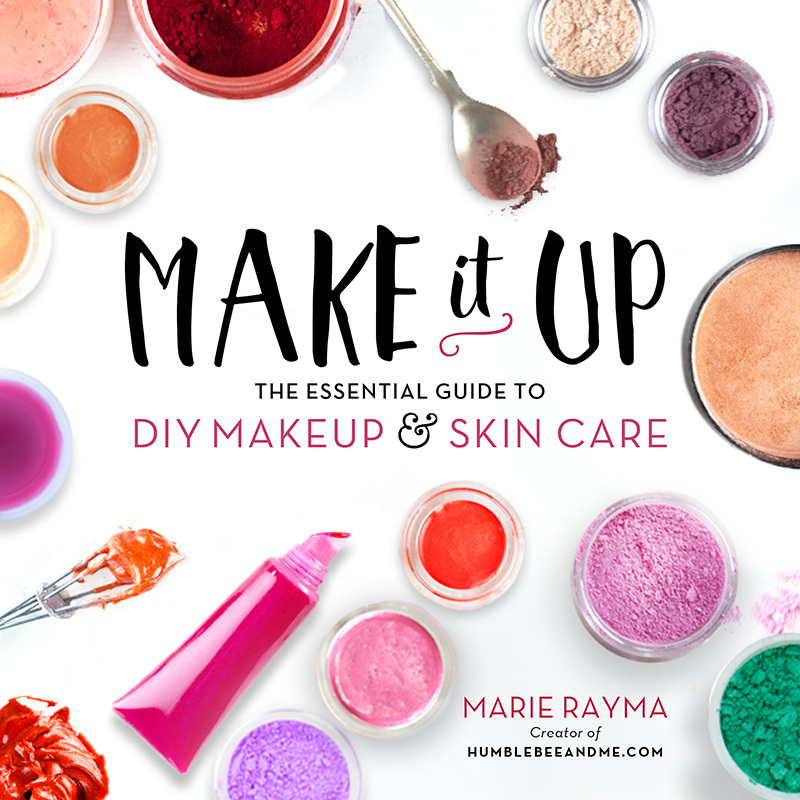 I would love to try it myself, but as a DIY Makeup Newbie, I’m concerned about using actual clay on or near my mouth…perhaps it’s just the thought that I’m having trouble with, lol. Yes, I would agree with you about the FD&C dyes…and clay *is* used in face masks…hmm…*pondering*….ok, I’m sold! 😀 I must ask, though: Do you have any advice on how I might achieve a “cooler” shade of red? Thank you for replying and please keep up the fabulous work! Awesome! You can “cool” colours off by adding a bit of blue iron oxide, and perhaps a bit of titanium dioxide or a white-ish clay to lighten the colour. Have fun with it! Hi, im not sure if someone already asked this, but do you think that Moroccan red clay would work just aswell as the clay you used? i also saw a lipstick recipe online somewhere using either beet root powder, cocoa powder, turmeric or cinnamon for color and then bentonite clay for a matte texture. The Moroccan red clay should work (I’ve definitely done several other lipsticks with different clays), but the colour will almost definitely be different. From what I’ve seen from a quick google images search, you might end up with a really brown lipstick. 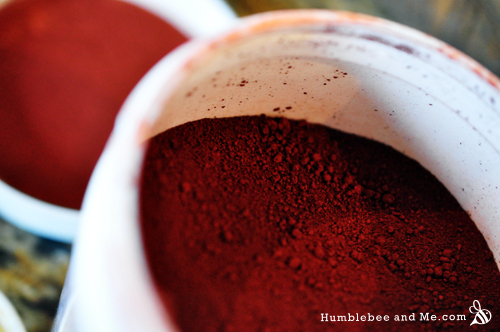 I made this recipe with Moroccan red, and while the consistency and feel of the lipstick was Amazing…the color came out a bizarre orangey red from the clay. HOWEVER, it makes for a pretty nice cream blush if used sparingly (waste not!). Marie, could you add a few drops of oil-solube carmine to increase the red punch if the reef clay is too brown? I have both liquid carmine and powdered carmine. I love your blog <3 I tried some of you recipes and they are simply amazing! I am wondering about using clays in lip balms. Don't they come out grainy? I imagine it feels like a bit of peeling? I would like to buy red clay, but if it's grainy in lip balm, maybe it's better using red oxide? Hi Maruska! It really depends on the clay. Something like rhassoul? Definitely very grainy. But the smoother, more finely ground clays like this one are great. I’ve had great results with Australian red and French red clays, as well as kaolin and zeolite ultrafine 🙂 Oxides are also great, of course, and I’ve made some great lipsticks with them, too. Thanks for reading! I am having so much trouble ordering magnesium stearate. I live in Denmark and there are shipping restrictions on it into the country. I have been unable to find it in any store here. Is there anything I could substitute? If it’s that hard to get I’d just leave it out 🙂 You may find that you want to use a bit less beeswax to help improve slip (that’s what the magnesium stearate is for), but I’d try the recipe as-is first as I do find it to be quite soft. Have fun! Hey Marie – I made this tonight and it didn’t come out Rose Red. More like 90’s dark burgundy. I followed the amounts on here so goodness only knows what happened. It’s not a bad color – I’m just too pale to wear it unless I’m trying to get my Morticia Addams on. Any idea what could have happened? I’m gonna try again only using 1tsp of red clay this time just to see what that does. Or mix some white clay in with the regular amount. This looks awesome, but I am concerned about it staining lips…in a way that it can’t be washed off at night. Did you find that to be the case? New Directions, which I love, has a lot of comments about how much Australian Red stains. Thanks so much. I love your site. I’ve never had it stain my skin, but it can definitely stain clothing—just like any dark lipstick, really. Even my lip stain can be scrubbed off with a washcloth pretty easily, despite my intentions 😛 Thanks for reading! Hi I am currently considering which shea butter would be best for lip balm… I stumbled upon your site hoping to find some information but I can’t seem to find any anywhere. Does anyone know if yellow or ivory shea butter is better for lip balm? Thanks!! 🙂 Love this recipe by the way!! Hi Shandra! It will depend on how much shea butter the recipe uses, and then on whether or not you like the smell of shea butter 😛 In my recipes you can’t notice the scent of the shea butter, so you can really get whatever you like, but if you know you hate the scent of shea butter you’d probably be best to go with the refined stuff (usually called ivory, but double check the descriptions to clarify the distinctions). I google searched “home made lipstick” and your face popped up! Talk about famous in the diy world! 😉 I wasn’t even on google images! Awesome recipe! I was so excited to try it out, so I ordered some Australian Red Reef clay from Etsy. My package arrived and I was a little confused because the color of the clay was a bit brownish. Anyway, I made the recipe and it is totally brown lipstick. Deep, dark, brown! Do you think I possibly received knock-off clay? 🙁 So bummed. What can we use instead of cocoa butter if you don’t have it? Yup, that’s right 🙂 Basically kokum butter is the only good swap for cocoa butter, though I definitely prefer cocoa butter. you don’t by any chance sell your creations, do you? i’d love love love to buy a tube of this. Hi , great stuff that you post I was just wondering if the clay is safe for the lips or if you happen to be wearing it on when you eat or drink a beverage would it be safe enough if you ingested it? Where exactly does this clay come from? So looking forward to making this over Christmas, my first diy make-up attempt :-)) Just ordered most of the goods online (via Etsy)! It was a bit of a risk since I have light eyes and light skin, dark hair and I wasn’t sure if it would suit me colourwise, but it somehow seems to ‘adapt’. Since I made it for my mother as well, and her skin is a bit more to the yellow side and dark eyes, dark hair and for her it works as well! Fantastic! I’m so thrilled 😀 WOOO! What’s the consistency like? Is the final photo you posted (in the tube) when it’s melted or after it has set? I’m making a huge batch for holiday gifts so want to know before I fiddle and fail :/ I live in mn and coconut oil is solid at room temp, would you recommend replacing avocado oil with coconut oil? Marie, I’ve been looking for a lip balm that stays long, and I’d like your opinion on carnauba wax instead of beeswax? Check out my experiments with carnauba wax vs beeswax—basically, carnauba will shorten the staying power of your lip balm significantly. It’s great to know on your experience and experiment on making lipstick. 😀 the lipstick that you invent seems like it give a matte finish. I’m looking for on how to make a matte color lipstick. Just wonder if it is a matte finish lipstick? HIi Adelyinr! I find it’s a reasonably matte finish, but it doesn’t look dry on the lips. It’s definitely not sparkly or high gloss, but it can look a bit wet, especially when first applied. HI there I love your blog, was wondering did you use white or yellow beeswax and do you think that you absolutely need the magnesium stearate? And if not should I replace it with something? Thank you so much for this treasure of a recipe! Hi Kadi! It really doesn’t matter if you use white or yellow beeswax. I used yellow. Magnesium stearate is for slip as I find the oxides can make the base a bit “skiddy”. If you can’t find it you may find that you want to use a bit less beeswax to help improve slip, but I’d try the recipe as-is first as I do find it to be quite soft. Have fun! Hi, thanks for this wonderful lipstick recipe! The consistency is just perfect. However, the color isn’t what I expected. Mine turned out brown. Should I lessen the amount of Australian red reef clay to achieve a red color? Hiya! Could I use bentonite clay instead of kaolin clay? It’s all I have on hand. is there an alternative to beeswax? I have discovered that since I have an allergy to bees that any lipstick with beeswax in it causes me to break out into cold sores. Ulta brand lipstick doesn’t have beeswax so I was just curious to see if you knew if there was an alternative. I’m actually developing a few beeswax free lipstick recipes for my book 🙂 You might find this interesting reading as a starting point for creating your own, though. Also… cyanide is water soluble, so please don’t judge the safety of something based on its solubility. Have you checked out Skin Deep? It’s a great place to research the safety of your ingredients. I also wouldn’t recommend adding water soluble pigments to a 100% oil base; read this for more info. Short version: it won’t work out well and you’ll have a gritty lipstick because the pigments won’t dissolve (see the beetroot lipstick I made in the linked blog). TKB Trading sells veg original magnesium stearate—I’ve honestly never seen animal origin magnesium stearate around, I assume plant based is significantly easier to produce. Happy experimenting! It’s always good to see somebody doing lots of research and playing 🙂 I just finished writing a book on homemade makeup and found magnesium stearate to be indispensable in creating high quality, high performance recipes, and I did a ton of research on it and found most of the claims of negativity were not terribly convincing and usually related to eating it, which we’re not doing (most of my jewellery isn’t fit for consumption, either, but that doesn’t mean I don’t want it anywhere near me). And yes, I have had raw carrot cake, but the metaphor still stands 😛 As I’m sure you know, raw carrot cake is not normal cake minus sugar, plus carrots—the entire recipe is formulated around the carrots being there and acting as a sweetener. Have you checked my Where to Buy Ingredients page for some places to check? Hmm. If you drop the wax content a bit that’ll probably help with the slip, but I’m not sure how long your wear times will be :/ Softer products = shorter wear, in general, without something like magnesium stearate and magnesium myristate to keep things glued down. Let me know what you end up trying! For the lipstick dose it have to be red reef clay or can I use Moroccan clay? 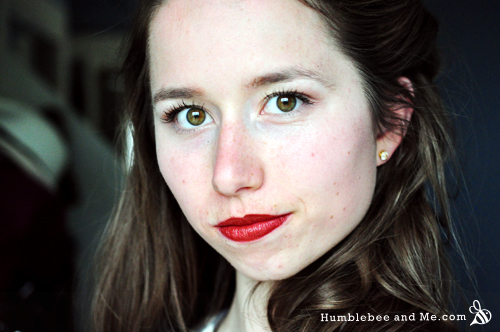 I have tried various diy makeup recipes, and this lipstick ranks as the most successful makeup item I’ve made. It really works! In fact it’s the best lipstick I’ve ever used, and is a staple in my makeup bag. I’ve varied up some of the proportions so as to make tinted lip balm and also a less pigmented (more oily) version of the lipstick that I often use for work. Thank you for this brilliant recipe. How can I make this thinner/softer/less viscous?